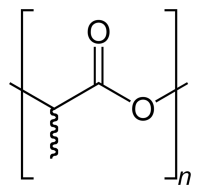 PLA or Polylactic acid is made from dextrose (sugar) extracted from biobased materials. It is the most popular bioplastic or biopolymer and the only one currently produced on a world scale plant. Natureworks has a 130 000 ton plant in Blair, Nebraska, and produces PLA under the brand name Ingeo. PLA can be best compared with PET-A and can be converted on the same lines (blow moulding, ISBM and thermoforming). There are also higher MFI grades that can be easily used in injection molding applications where it can be a replacement for polystyrene (PS). This biopolymer is also very suitable for fibre extrusion where it can be a replacement for polypropylene (PP). PLA can biodegrade under certain conditions. PLA (polylactic acid) products can be composted in industrial installations where heat (70°C or more) and moisture (min 70% RH) can be controlled. The material is hygroscopic and needs in most cases pre- drying before converting. All grades have biocompostable certificate EN12342. The material is often used in blends or compounds to enhance the properties of the material. Standard PLA grades are transparent and have high gloss. Fibre extrusion: tea bags, clothing. Thermoforming: clamshells, cookie trays, cups, coffee pods. Blow moulding: water bottles (non carbonated), fresh juices, cosmetic bottles.